Things start getting trickier if you’re on a Mac with older versions of the Mac OS. 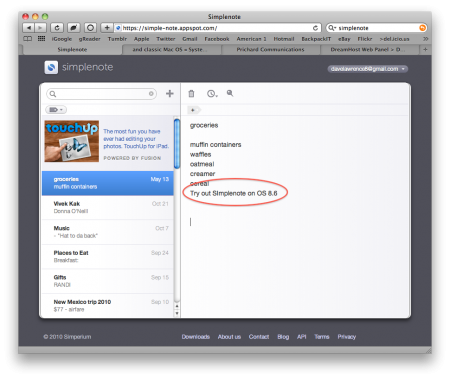 I couldn’t do tests with Mac OS 8.5/8.6, though I suspect that if you have a capable Mac and a suitable version of iCab or Opera (or maybe even Internet Explorer 5), you could still be able to access the Simplenote Web interface. Having set up my dream dual Mac OS 8.6/9.2 system, it was possible to test Mori’s suspicion. Both Opera 5 and 6 treated Simplenote much like iCab did (above), loading an empty text field for a new note, but nothing else. And the formatting looked awful. 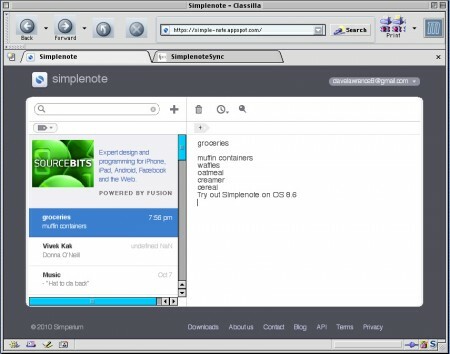 Classilla, it seems, is the Simplenote trophy winner on Mac OS 8.6 – a good thing to keep in mind for the lowend Mac users out there who want to sync notes between their Mac and iPhone or iPad. Posted by davelawrence8 at 9:39 pm on November 11th, 2010. 3 comments... » Categories: lowend, macs, software. 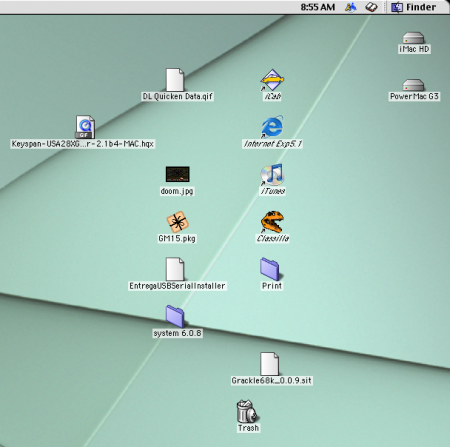 Tags: classilla, G3, imac, os 8.6, powermac, safari, simplenote. Subscribe via RSS. As before, the PowerMac wouldn’t recognize it or the Keyspan adapter I plugged in. The Keyspan adapter drive I downloaded (USA-28XG) didn’t even recognize the adapter I plugged in. 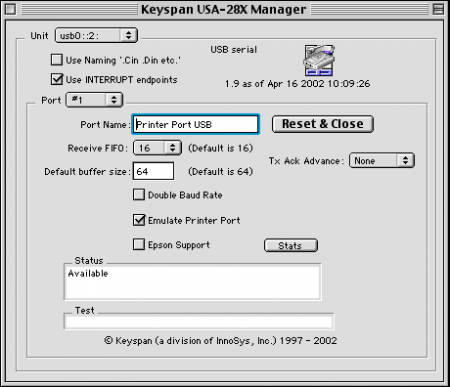 But then I remembered: back when Keyspan was gobbled up, I saved a backup copy of the USA-28X adapter installer. Maybe the one I saved would work. The 28-XG hadn’t worked. Would the 28-X? Before, in the run-up to the System 7 experiment, the lack of a Newton driver was all that was keeping me from going through with the plunge into obsolescence. With the ability to sync the Newton, I can work more on the whole Claris Organizer project, and keep backup files of all the eMate’s packages on the PowerMac’s HD. If I need it, I can use the iMac’s HD as a backup system. It’s beautiful. This whole deal taught me two lessons: how easily I forget, and how important it is to keep backups of files. Especially ones you can’t get on the Internet any more. The main reason I couldn’t go through with my Seven Day of System 7 experiment was because I couldn’t get the eMate (or the MP110) to connect with the PowerMac. Shuffling between the iMac and the PowerMac seemed like a hassle in an already full-of-hassle experiment. Now I only lose the bulk of the iMac, not the brains. Really, I was waiting to find that stupid Entrega driver CD. Since it never surfaced (notice I’m blaming the disc), the experiment never happened. But now? Man, it’s on. I have everything I need: my iMac’s games, files, and configurations; the ability to connect and sync my Newtons; a faster, more expandable machine in the PowerMac. My plans still include buying a flat-screen monitor to save space – probably some refurbished Dell el-cheapo LCD. In the meantime, the Studio Display will be an workable stand in. You know what I really like? The hum of the PowerMac. More delicate and softer than the PowerMac G4′s fans, the Blue and White provides a nice, steady white noise that I find relaxing. It’s something you never hear on modern Macs; the noisiest thing on my desk now is a pair of external hard drives. You can hear and feel those things kick on, especially during Time Machine backups. A room full of PowerMacs might be a bit much, but the one I’m keeping produces a soothing whir that’s not obnoxious or distracting. 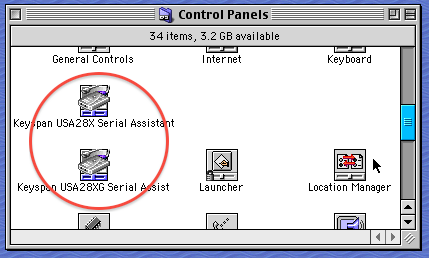 So by transplanting my iMac’s brain and finding a Keyspan adapter driver, I’ve turned the PowerMac G3 into an all-I-need Macintosh – the best of all worlds in one complete package. Posted by davelawrence8 at 6:34 am on October 18th, 2010. No comments... » Categories: eMate, lowend, macs, system7. Tags: adapter, driver, eMate, G3, keyspan, newton, powermac, serial, USB. Subscribe via RSS. Since I made the decision to retire some of my classic Macs, I had some thinking to do: what parts, if any, would I keep? And would I miss any functionality? I thought about all the hard drives, with their drivers and software, that were going bye-bye, when it hit me that I could install a hard drive or two into the PowerMac G3 I was saving. And since the iMac G3 was the only Mac that would work with my serial-to-USB adapters, maybe a brain transplant was in order. So that’s what I did – took out the iMac’s hard drive and installed it into the Blue and White, just to see if it would work. This meant opening the iMac and getting to the hard drive. 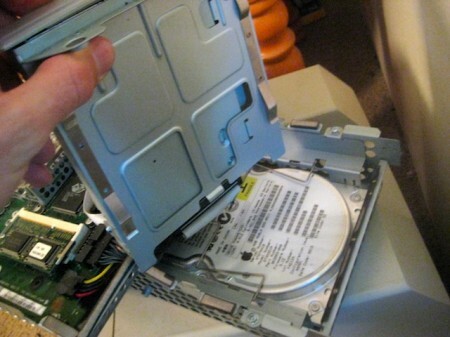 I’ve covered how to get into an iMac G3, but getting to the hard drive was a bit trickier since it sits snugly below the motherboard tray in some infernal metal sleeve. 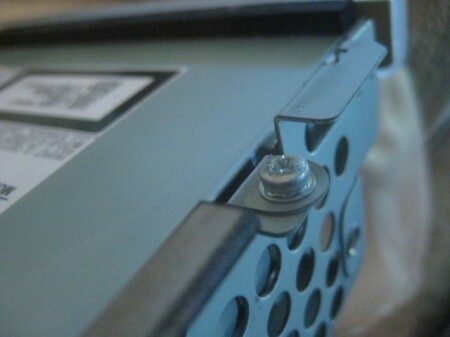 After I unplugged the cables and got the CD-ROM drive out of the way, I had to remove a few more screws in the side of the drive and get rid of the little metal prong that held the drive in place. A little bit of wiggling and the hard drive was out. From there I placed the iMac’s hard drive in the second bay of the PowerMac (above), set the screws in the side to hold it in place, and plugged in the connection and power cables. After the installation was complete, I got the question mark Mac folder on startup, meaning either one drive or both were conflicting. 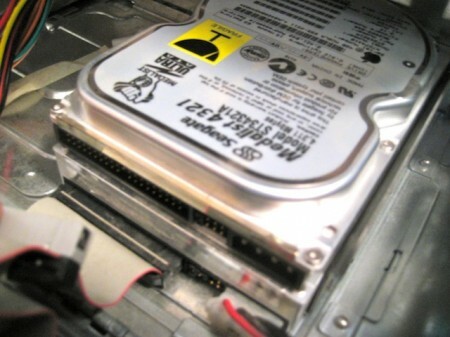 The iMac’s drive was set to be a master drive, which is a no-no in the ATA world. So I set the original PowerMac drive to master and the installed iMac drive to slave, and the issue went away. When the PowerMac did start up, it booted into its usual OS 8.6 drive, and what do you know – there was the iMac’s hard drive on the desktop. Something weird that I never expected: the PowerMac and iMac desktops were combined. Looking at the desktop above, the Entrega file, Doom.jpg, and Grackle file were both on the PowerMac’s desktop, not the iMac’s. But each time I reset the system with a different startup disk, both environments seemed to share the desktop files. Pretty neat. One weird issue that hasn’t gone away, however, is my iMac’s tendency to not shut down or restart. Heading to Special > Shut Down or Restart made the iMac’s screen flash, the icons blink out for a second, but then no restart or shut down would happen. To turn the thing off, I had to put it asleep and then unplug it. Maybe installing the hard drive in the PowerMac would help, I thought. But no dice. After setting the iMac HD as the startup drive, the restart/shutdown problem was still there. One suggestion had me dumping the OS preferences and emptying the trash. Trashing the Mac OS and Finder prefs didn’t help. Others suggested a complete reinstall of OS 9, which is a method that sounds more like a Windows thing than a Mac thing. I tried a series of boot-up key combinations to no avail. The only thing that worked reliably was setting the iMac HD as the startup drive, and boot with extensions turned off (holding Shift on bootup). That let me turn off and reset the iMac HD. The other weird issue: I set up Multiple Users on the iMac, thanks to OS 9′s then-new feature, but a while back the iMac started booting into the Owner account automatically – there was no login required and no Multiple User welcome screen. Heading to the Multiple User extension manager, I found the strangest thing: there wasn’t one. Well, the extension was there, but it wasn’t working. It showed up in the Applications menu as an option, but offered no interface for managing the actual extension. It’s hard these days to find reliable troubleshooting information for OS 8 and 9, and a lot of my searches have come up empty. But really, I have the iMac’s hard drive in the PowerMac – saving both space and time. And I can still accomplish most of what I need without the physical iMac being present. So mission accomplished. Next up: connecting my Newtons to this new setup. Posted by davelawrence8 at 6:35 am on October 11th, 2010. 2 comments... » Categories: DIY, eMate, lowend, macs. Tags: B&W, dual, eMate, G3, hard drive, imac, keyspan, newton, newton connection, os 8, OS 9, powermac, transfer. Subscribe via RSS. Funny how one little driver can set your plans back. Here I was, all ready to begin the week-long experiment using nothing but classic Macs and Newtons, when I discover that I lost my Entrega serial-to-USB dongle’s driver disc. The CD came in a little white envelope and was next to a bunch of other RAM sticks, adapters, Firewire cords, and software CDs. Now it’s gone. A search through the Internet yielding absolutely squat, and the Newtontalk list didn’t offer any suggestions. The closest I came was one of those sleazy driver sites that makes you wade through stupid ads to get to what you need. When the driver download came up, it still wasn’t what I needed. Apparently, Entrega was bought out by Xircom, who was in turn bought out by Intel. Intel posts a bunch of downloads for the old Entrega/Xircom adapters, but only an old manual for the one I needed (model U1-D8). The driver is nowhere to be found. 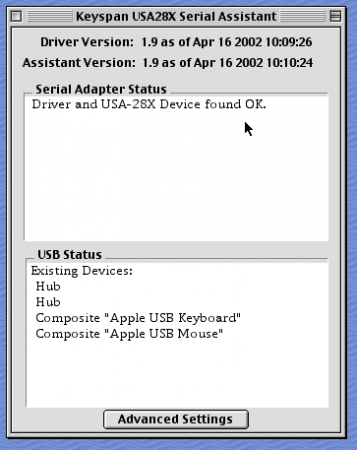 The Entrega adapter was a marvelous piece of technology, helping me to connect to my iMac G3 and becoming my go-to gadget for all things Newton. 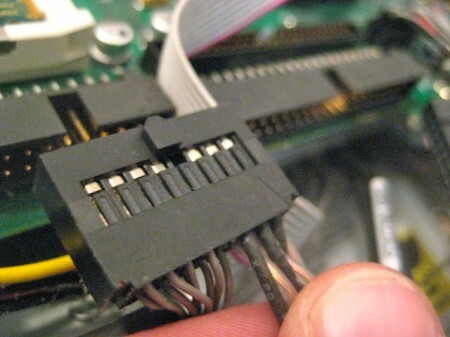 Even though it’s a USB adapter, it needs a driver to operate correctly. And the usual Keyspan adapters don’t work on my pre-OS X Macs. 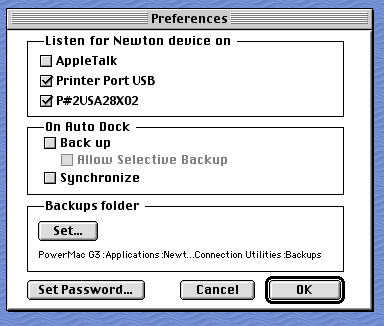 My hope in this system 7 experiment was to have my PowerMac G3 run as the hub of the whole operation, syncing my Newton, doing most of the heavy lifting, and connecting with the outside world. 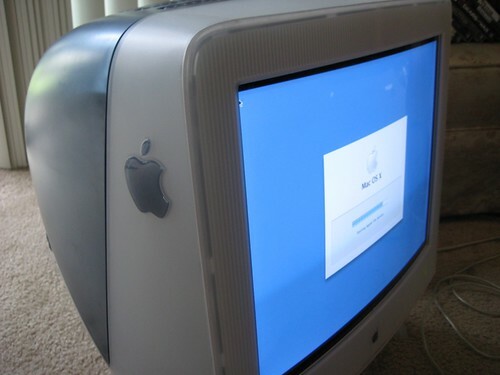 It’s true that I could simply connect my Newtons with my iMac G3, but I’d rather have just two Macs running during the experiment: the PowerMac, and the LC 520. So everything’s on hold for now, until either that Entrega disc shows up (after a fifth or sixth sweep of my apartment) or I give up and go with the iMac for everyday tasks. Posted by davelawrence8 at 12:53 pm on June 21st, 2010. 3 comments... » Categories: lowend. Tags: adapter, classic, eMate, entrega, G3, imac, intel, mac, newton, powermac, serial, USB, xircom. Subscribe via RSS. As I get ready for Seven Days of System 7 (or, more accurately, OS 8), my focus is on loading my PowerMac G3 with software that I might need over the week. Apps like a good, sturdy browser, an image editor, and a music player are all important. For music, I have a few options – all apps that, as the classic Mac OS period ended, paved the way for iTunes’s dominance. These are apps like SoundJam, iTunes predecessor, and Audion from Panic. I grabbed the final copy of Audion, but wondered if OS 8 could handle an early copy of iTunes. In a roundabout way, it can. Apparently, the original version 1.0 and 1.1 are both able to run on Mac OS 8.6, with help from a certain patch. Load the patch, install iTunes 1.0 or 1.1, and enjoy the wonderfulness of Apple’s first version of its now-dominant music app. Except when it comes to legacy software, patches, and theoretically-incompatible operating systems, failure is always an option. First, the patch. Developed by Loizos Pavlides and last updated in 2001, the patch requires that the iTunes.smi file, the patch installer, and the iTunes installer all reside on the same slab of hard drive space. In my case (and from what I could gather), the best place was the Documents folder. If you try simply installing iTunes on the Mac’s hard drive, it will proceed as normal. You just won’t be able to open the app. There it sits on your hard drive, useless and almost foreign with that classic icon. Instead of today’s well-known double eighth note, the iTunes icon used to sport three eighth notes, all different colors. The patch and the two iTunes files now sitting side by side in the spatial Finder, running the patch is a no-frills affair. Pick your copy of iTunes, select everything you want to install (above), and away it goes. 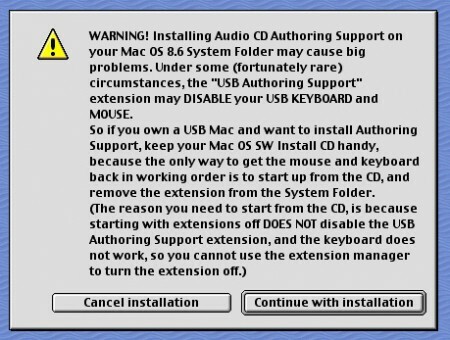 Except that if you pick the “CD Authoring” options, you get this weird warning about incompatibility and USB devices. 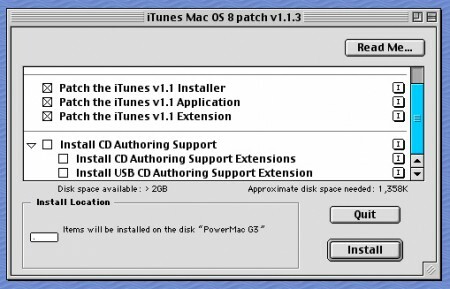 I had enough trouble finding a USB patch for Mac OS 8, so I opted not to include the CD authoring support. For one, it’s probably the longest non-gibberish warning dialog I’ve ever seen. And two, what a hassle. If this means I live without iTunes’s CD ripping abilities, I’ll live. There’s always a CD player (so ’90s!) handy. After the patch does its thing, you now have another version of iTunes sitting in the iTunes folder, with a “for Mac OS 8″ title. This is the one to use if your Mac is running OS 8, right? Wrong. At least in my case. Each time I try to run iTunes for Mac OS 8, it crashes. The dreaded Error Code 3. Digging into the Classic Mac OS error code database, error 3 means “illegal instruction error,” and running iTunes in Mac OS 8 is definitely illegal. Like, PRAM-zapper-proof illegal. Though Macwizard says it’s “very common,” the solution isn’t. I came up empty-handed after a bit of digging into the possible solution to the problem. And no matter how many times I reset the PowerMac, iTunes never opens without crashing. One solution is to simply upgrade the G3 to OS 9, but as I’ve said before, I like the idea of having a Macintosh for every version of the Mac OS. 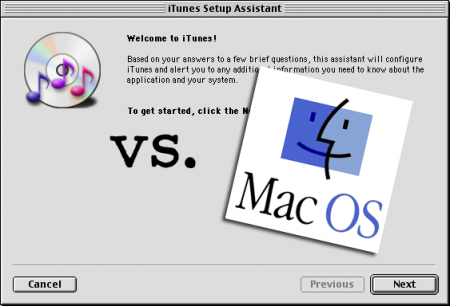 Reading more of the comments from the patch only added to the confusion – and frustration – seeing that other users were experience hit-or-miss installations of iTunes on OS 8. So for now my attempts to get the thing going are stalled. Posted by davelawrence8 at 6:16 am on May 27th, 2010. 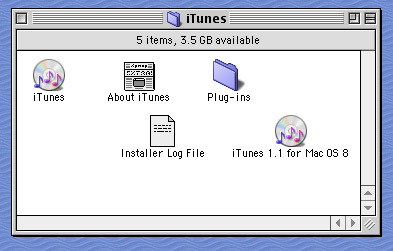 4 comments... » Categories: itunes, lowend, macs, system7. 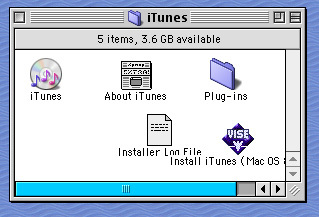 Tags: apple, G3, itunes, itunes 1.1, itunes patch, mac, mac os 8, powermac, system 7. Subscribe via RSS. Low end Mac users are masochists. There’s no easy way to take a classic Macintosh and do modern, enjoyable work without some pain or effort involved. Everything is a project. Now, for most of us that’s not a bad thing. In fact, it’s why we work with classic Macs. Either that, or we know low end Macs so well that using anything prior to OS X comes as second nature. Also, it’s a hobby. …as my main computing machines. I’m leaving my new 21.5″ iMac switched off, using my iPhone 3G for phone calls only, and relying only on Apple products that were released in the 1990s. 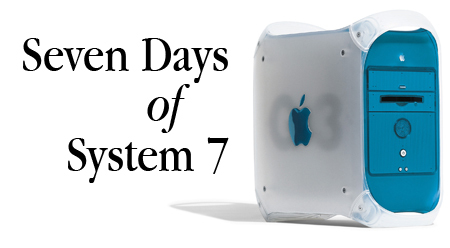 I’ll call it Seven Days of System 7. That’s not totally accurate. 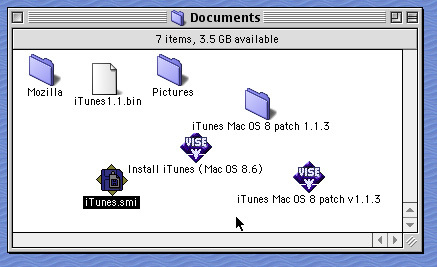 I’ll also be using OS 8 (on the PowerMac) and OS 9 (on the iMac). For portability, contact management, and calendar duties, I’ll use my Newton MessagePad 110 and eMate. 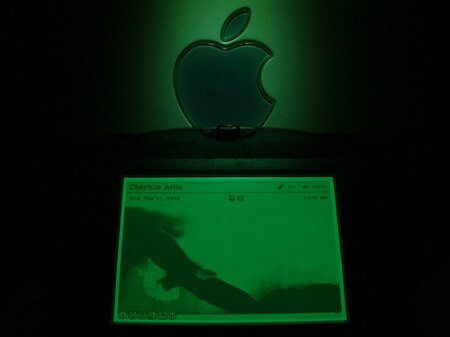 And I might pull out my iBook G3 and boot into OS 9 for some portable Macintosh. The experiment, inspired by Morgan Aldridge’s and Riccardo Mori’s experiences, will be me attempting to get by – or even be productive – on non-Mac OS X machines. This includes any writing, web browsing, scheduling, graphic design, and web development. For the week, I’m setting up a special page here at Newton Poetry that will be a sort of proto-blog – where I can post updates through the week. The entire thing will be made on my PowerMac G3 sporting Adobe’s classic HTML editor, PageMill. Because it’s only a week-long experiment, I won’t need much more than that. I’m not going to do any heavy graphic design lifting, or attempt to do a whole lot. It’ll simply be a week to see how easy it is to be productive and live day-to-day on low end Macs. There are a bunch of sources I have to credit for the help, including my podcasting pal David Kendal (for the links to Panic’s free offerings), System 7 Today for some game ideas, UNNA for Claris Organizer, and eBay for PageMill and WarCraft II. The experiment will take place in the next week or two. In the meantime, if you have any ideas or software to try out, let me know. Most of all, wish me luck. Posted by davelawrence8 at 6:17 am on May 6th, 2010. 5 comments... » Categories: lowend, macs, system7. Tags: experiment, G3, imac, lc520, lowend, macintosh, macs, powermac, system 7. Subscribe via RSS. The original idea behind the One Used Mac Per Child was to take classic Macintoshes and give them to underpriveleged kids who could use a computer. Recently, though, I’ve learned the idea can apply to anyone who needs a capable computer to get things done: word processing, e-mail, basic Internet surfing. I was finally able to put my idea into practice with Mirza, my new Pakistani neighbor. Mirza moved to Michigan from Karachi, Pakistan to pursue a career in physical therapy. He earned a work visa with our local hospital and is spending two years in America learning the trade. Mirza left a wife and three kids back in Pakistan. He tries to talk to them every day, but the phone bill is getting expensive. E-mail is much cheaper. But first, he needs a computer and an Internet connection. He asked me to go “laktop” shopping with him. He balked when I told him the price of a decent laptop, so I remembered that I have a very useful PowerMac G4 sitting around my apartment looking for something to do. Finding a modest high-speed connection in our area is easy. Connecting the Mac to the Internet will be simple. But now I’ve learned that Mirza has virtually no experience with computers. He doesn’t know how to type, or how to navigate the Web, and doesn’t even have an e-mail address. At least now he has a used Mac to get him by. 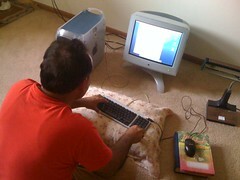 For his simple needs, the PowerMac – running OS X 10.3 with a bit of TextEdit and Firefox – will suit him just fine. A combination printer/scanner, to scan family photos and print driving directions (once he gets his driver’s license), is all that’s missing. For everything else, the PowerMac is perfect. Sure, it’s an older Mac lacking the latest and greatest web browser and software package. It’s not the quietest machine anymore. And the giant CRT Apple Studio Display cramps his small apartment. But since he won’t be doing any video transcoding any time soon, the 400 MHz, 768 MB RAM machine will carry his workload with nary a sputter. After he buys an DSL connection, he’ll be up and running in no time. In fact, he won’t know any different, and I saved him from being soured on computers with some cheap Windows Vista laptop. I was just glad to have an extra, useable Mac hanging around for Mirza to use. In the end, I saved him several hundred dollars (at minimum) and handed him the best operating system of its time. If he wants an different computer, then I’ll take him “laktop” shopping. Teaching Mirza to type? That’s another project entirely. Posted by davelawrence8 at 5:45 am on September 22nd, 2009. 2 comments... » Categories: lowend, macs. Tags: g4, neighbor, OUMPC, pakistan, powermac. Subscribe via RSS.